It's an alternative to using a fridge as the mine sits at a fairly constant 6 degrees celsius, does vary between about 4 and 8 in the extremes of the year but normally 6ish. I'd be slightly worried about that nuke landing in a cooling lake of an old power plant, are there any spent fuel rods still there? Because that would add tot he fallout quite badly. No rods, but the reactors might be damaged by the blast which would add to the fallout I think. Drops straight into the cooling lake for the decominssioned inland nuclear power station to the south. With 15 minutes, I'd grab my girlfriend and drive up to the the slate mines at the top of town, go down a couple of levels under the surface and wait it out. I think they should keep me safeish. 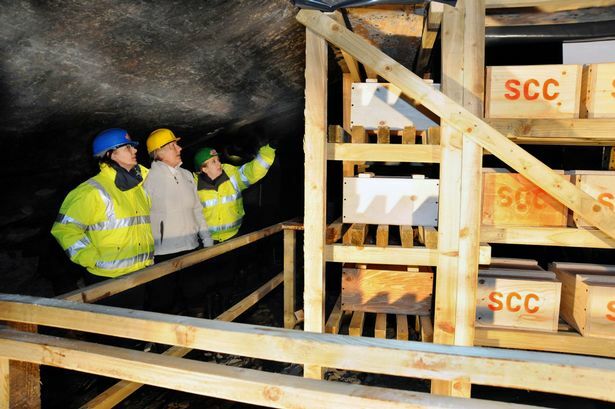 The roof of a slate mine would probably spall very badly if it was only 2km from a 500kt nuclear blast. Aka crush you. I mean you may not have a better option, but slat splits in a way which is super undesirable in this kind of situation. A small amount of spall might not be fatal, but any large amount and you're going to be both crushed and suffocated by the dust cloud. Spent fuel is kept in an indoor pool until cool enough to be air cooled by natural circulation, which takes about 20 years. The artificial lakes some nuclear plants have are for cooling the active reactor; the moment you turn off a reactor the decay heat load drops about 99% in seconds and then steadily drops lower until you hit that air cooling works point. Spent nuclear fuel being in the proximity to a nuclear blast isn't going to be that big a deal unless its directly exposed to the fireball, an active plant being blown up by a nuke meanwhile would intensify the fallout enormously depending on the details. I'd take the mine over anywhere else I could get to I think. It's possible to go down 4 levels pretty quickly, and the pillars that support the mine haven't been interfered with in this mine, unlike the one over the road that collapsed in the 1870s due to mining the pillars. Thinking about it a little more there are some tunnels that lead much deeper into the mountain than the where the visitor centre is. I don't think that the mine I'm thinking of using would be too badly affected as there are 3 others slate mines between it and a line of sight on the powerstation, which might give some protection from the blast.